...that the New Mombasa Police Department was headed by the corrupt commissioner Kinsler? A roadblock is an object intended to obstruct the passage of vehicles on a road. Roadblocks may either be used to close off select sections of a road, or to block traffic altogether. 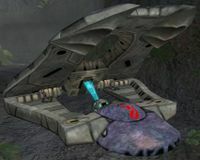 A Covenant deployable roadblock in Halo 2. The Covenant employ roadblocks to block access to enemy troops and vehicles that might try to attack or bypass a fortified position. These roadblocks are small flat platforms that are placed on the ground, the top section is then pushed up on a hinge by an anti-gravity beam. The gravity beam can be disrupted by sustained weapons fire, or a small explosion, nullifying the roadblock's use by lowering the raised platform and allowing passage. Many Covenant troops will also use the roadblocks as a cover when being fired upon. These roadblocks can also be used as a ramp for a vehicle to jump over enemy fortifications. The Covenant defense barrier, known to the Covenant as the Guardian Triptych, is a sturdy tripartite field fortification that is commonly deployed as a roadblock. It can be destroyed but it can still stop vehicles, especially Type-26 Wraith. Human roadblocks are often simply small concrete walls, though some highways, such as New Mombasa 105 East or the streets of New Mombasa, are equipped with sections that can be raised to act as roadblocks. Human-made roadblocks appear on a few campaign levels in Halo 3, such as Tsavo Highway or at the beginning of The Storm. They appear in no multiplayer maps automatically, but they can be placed with Forge. They can be damaged, but not completely destroyed. They also appear in Halo: Reach in some campaign levels such as ONI: Sword Base, Nightfall, The Package, The Pillar of Autumn and Lone Wolf and in the multiplayer map Forge World as a Forge Object. A Covenant Guardian Triptych shielding an anti-vehicle barrier. A human roadblock in Halo 3. A Covenant defense barrier in Halo 3. A Guardian Triptych in Halo: Reach.